It was feared that due to frequent invasion of westerlies, Pakistan may be abandoned of the important heating trend but we saw that as soon as May started temperature started to rise. It is worth-mentioning the ‘true’ heat waves of summer are missing at the moment. High temperatures have been witnessed only in Sindh and Balochistan while Punjab is missing the heat waves due to flow of westerlies. The second heat wave (stronger than the first) is expected in the coming week in Sindh. *A weak Western trough ’05’ is over extreme north-eastern areas of Pakistan, it has broke the trend of high temperatures. Another Western trough ’06’ would come on May 9 night, it would follow the same path. Activity in the North; Tropical activity seen in Bay! Since the coming WD ’06’ would be far away from the major cities of the northern areas of the country therefore most activity can take place in the Gilgit-Balistan province however dusty winds can occur on May 10 till May 12 in the extreme and adjoining northern areas including Peshawar and Islamabad with cloudy intervals. Temperatures can drop by 2°C to 3°C in Islamabad, Lahore, Peshawar, Multan, Bahawalpur, Faisalabad, Gujranwala and adjoining cities due to the presence of western winds from May 10 till May 12 after that temperature would again rise. During this period dust storm with drizzle/isolated shower can occur in the mentioned and their adjoining areas while moderate rain with strong dust storm can occur in Azad Kashmir and adjoining Khyber Pakhtunkhwa. The Sindh province’s upper cities like Sukkur can experience dusty winds on May 10/May 11 while the temperatures would remain around 40°C till 42°C. A heat wave is expected in Sindh starting from May 12 excluding coastal areas, temperatures in upper cities can reach 45°C/47°C during that heat wave. Karachi’s temperature could remain 34°C/36°C during the next coming days with fast winds, partly cloudy weather can also occur. Bay of Bengal’s show a flop? Arabian sea to have it’s own show! *Low pressure is over southern Bay of Bengal, it could intensify into a cyclonic storm ‘Mahasen’ during the coming, a delay in its formation has occurred. No affect on Pakistan. Pakistan Weather Portal (PWP) has mentioned the things expected in the rain season in its Monsoon Article – Part II. Depression BOB 01 – Bay fails to throw a big show !?! Till the end of this week there would be a depression/deep depression in the southern Bay of Bengal that could affect the eastern coast of India though earlier it was expected to become a strong cyclone and create havoc in the eastern coast but now it can develop into a weak cyclonic storm with pressure of 996/994 mbar. The system could bring widespread heavy downpour to north-eastern India, Bangladesh and adjoining Burma. 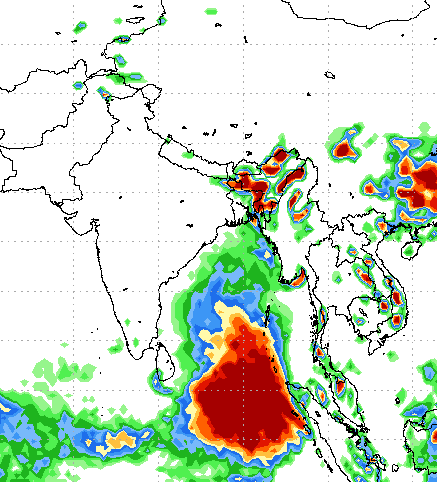 During this week, the low pressure/depression can drop around 400 mm rain in the Bay of Bengal! 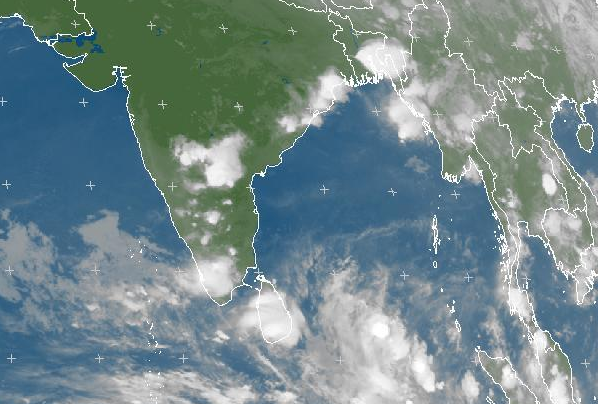 Even before this low pressure, widespread Pre-monsoon downpour has hit North-eastern India, Bangladesh and Burma. Due to intense heating over central India, the onset of monsoon is expected early in India. 90 mm precipitation has occurred in the cities of Bangladesh that has flooded towns. Arabian sea warming up for something? During late May, there is a slight possibility for the formation of a depression that it likely to travel till central Arabian sea after that its future is disputed. ← Pakistan’s Monsoon: Do we really need a Monsoon season? salam.. babar.. what’s your opinion on monsoon? normal, above normal, or below normal..? From what i see.. el nino won’t be occuring so it might be normal.. or maybe clash of frequent westerlies with monsoon air maas may MIIGGGHHT (optimistically) will result in above normal rainfall..
Sir is there any possiblity of flooding in sindh during this monsoon? Flooding can never be ruled out in monsoon season. Thank God coastal areas won’t experience the coming heatwave. thank god isb is safe from intense heat and It is getting rainfall. When doesn’t Islamabad get rainfall ? Islamabad is the second wettest place in Pakistan.With large pine and broadleaved forest on Margalla hills.Large green belt planted with thousands of trees,3 lakes,22 streams running through the city and Korang river. Islamabad gets 1200 mm of rainfall every year and 790 mm average rainfall only in the monsoon.The first being Murree.What will happen in Islamabad any rain. Can you give the forecast for election day in main cities and also can you if possible mention expected maximum temperature that can reach in Lahore on 11th May? Abbottabad gets the same rainfall.Islamabad is on the edge of Hazara division.Any storm coming to Islamabad and khaur. Does heating of the Arabian sea make western Himalayas wetter. Yes the moisture of Arabian sea play an important role. It is written in this article. And does the same dog for jhal Magsi ? When moonsoon season will start in Lahore, Gujranwala? It been two days the clouds are heavy and dark but no serious rainfall. Babar Bhai When will Monsoon rains start in Risalpur? and this year it would be normal? Chances in first week. It could be near normal. very well detailed article ………………… aap boht mehnat se articles prepare kartay hein….. really appreciate ur hard work …… keeep it up! What is normal rains by the way? I mean last year it rained late but was the intensity normal or more the normal ? In short, Normal rains should be around the average rain during that time period. Last year the rains were below normal in Sindh excluding upper Sindh where one wave of rain brought record-breaking rains which was an isolated event. sir karachi main monsoon rain kab tak start hongi is year plz is bare main bataen aur is dafa ziyada rain hongi karachi main ya nahi plz is bare main update lazmi kar den plz waiting your answer. Is there any chances of Rains in Khi? any chance of rain in june?